Katayama Steel Rule Die Inc.
Formaer president Katayama visited Nagaoka City and met president Akinori Yoshizawa of Yoshizawa Industry Co., Ltd. on the introduction of editor in chief of industry magazine 15 years ago. He was said at that time, "It is sure to become a subject of one's study in the processing field, because the paperboard (cardboard) is a useful industrial material". Our company has done the effort to specialize in manufacturing dieboard that stamps out the paperboard for years, and to contribute to the quality and the productivity enhancement in the customer's paper container production. However, three people evade the responsibility as paper of material is bad for the trouble such as "Paper dregs go out of the cutting part of paper by the blade's collapsing." and "The crack enters the surface when paperboard is folded." or samping out machine and operation are bad or dieboard is not proper each other. And, having finished was a current state then if it stored while managing to correct dieboard in every case after all when it was good. What was bad, and what was good? 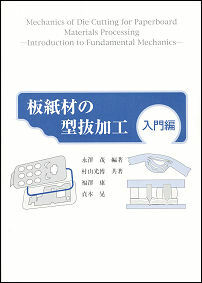 To have begun to study knowing a basic thing, President Katayama met Shigeru Nagasawa associate professor of machine department of Nagaoka University of Technology. Because the pilot machine was first needed for the research to begin, the dieboard testing machine was produced, and it began from the data collection that became basic. It came to be able to receive cooperation from Yasushi Fukuzawa professor's laboratory as the analysis advanced. And blade material production company and stamping out machine producing company besides our company participated in the enterprise, the offer of the materials were received from the paper-manufacturing company and the stamping out technology was researched overall. Thus, it applied for academic conference presentation, the treatise, and the patent of many in ten years or more. What is the advantage of the industry-university joint research seen from our company? First, the university as research laboratories enables development based on a basic theory of our company that doesn't have the laboratory. Secondarily, the experimental data of the university as the statutory board can be shown. In addition, the aspect of employee education has the meaning in both the university and the industry because there are persons who acquires master and doctor's degrees and became teacher at technical college and university, advanced persons to our industry. The research started from stamping out of paperboard comes to include the research of making of material compound and resin material in recent years, and it is developed with industrial product markets other than the paper container such as the electronic parts. It is a role of the enterprise that the seed that piles the elemental technology by a joint research and obtains is made a product, the flower is made to bloom, and making the truth become. Then, we moved in promotion facilities "Nagaoka Business Incubation Center (NBIC)" in Nagaoka City to develop the practical use of a new product and the business in a new field in 2004. Especially, the system of support to center on the information network of introduction of the cooperator who set it to regional situation and field making is effective to advance the business scheme. he result existed, it was possible to start in life from the promotion facilities by installing a new base in Nagaoka Ofiice Arcadia in 2008. The problem of the stamping out processings of paperboards is composed of systems of various integrated technologies. It is necessary to know sharpness of tool and deformation performance of amputated material, and, first of all, to produce dieboard by which you may select shape of an appropriate tool and an appropriate material. 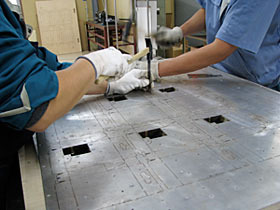 Next, the operation technology over many topics of securing the durability of the blade canceling irregularity of cutting of flatbed machine , and the consideration of the ruled line must surely be formed without the surface crack, temperature management to stabilize mechanical characteristic of print paints(crack, peeling off, changing in quality of frictional properties, etc. ), adjust ruled line rigidity necessary for paper container manufacturing process, and promptly diagnose and restore damage of tip of the blade and paper blocking, etc. diagnosing it is needed, because of paper container manufacturing standpoint. This book simplifies very parts of these further and is an attempt of the analysis and the explanation. copyright© Katayama Steel Rule Die Inc. All Rights Reserved.